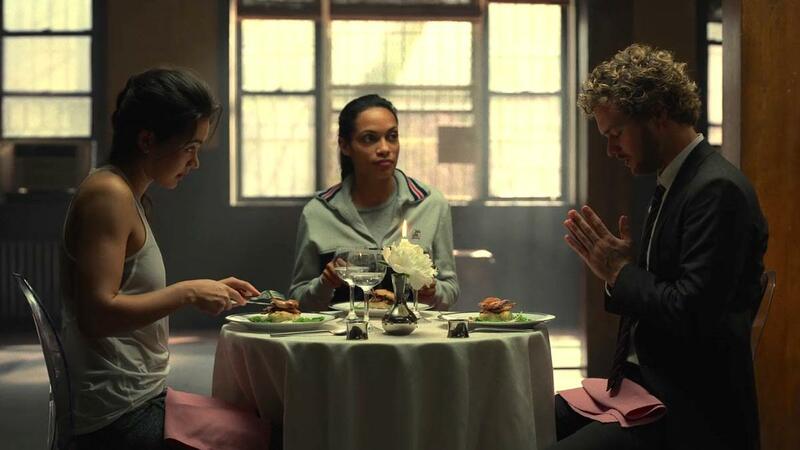 Iron Fist, Season 1 Episode 5 "Under Leaf Pluck Lotus" Review – AiPT! Ep. 1: "Snow Gives Way"
Ep. 2: "Shadow Hawk Takes Flight"
Ep. 3: "Rolling Thunder Cannon Punch"
Ep. 4: "Eight Diagram Dragon Palm"
Ep. 5: "Under Leaf Pluck Lotus"
Episode five of Netflix’s Iron Fist is an odd one. The A-story has Danny tracking down leads on drug smugglers working out of the Rand corporation’s recently purchased waterfront warehouse facilities, but the B and C stories fly in pretty weird directions. On one side we’ve got Joy figuratively crushing the souls of several people who’ve been stricken with cancer by one of Rand’s processing plans (and we’re supposed to still be on her side just because she feels bad) and then there’s Ward taking some of the Hand’s synthetic heroin to deal with his daddy issues. I think it’s pretty clear that the writers of the series had this grand vision of the Meachum family being like the Lannisters – vile and base, but relatable and understandable. They just haven’t been able to broach those last two points and we’re about halfway through the season. As per usual, Colleen “Best part of the show” Wing tends to set the most interesting parts of the episode in motion – and not just because she helped bring a sweaty Rosario Dawson in short shorts into the show. Fan service aside, it’s great to see Dawson’s Claire back in the show. As the Marvel Netflix Nick Fury, she usually is the impetus for solid change in these shows. Anyway Danny shows up at Colleen’s dojo to ask her help in tracking down the drug smugglers – with a five-star catered lunch no less. It’s in that dojo that we find Colleen training Claire so she doesn’t have to play damsel in distress in all of these shows. Claire sits in on the lunch to get a free gourmet meal (REALISM!) and actually pulls some character development out of Danny. We get the first mention of Davos (Iron Fist’s comic rival), learn that Danny’s still a virgin (to colleen’s wide-eyed surprise) and that his isolation and loss is what drove him to pursue the Iron Fist role. The developing romantic tension between Colleen and Danny still feels a bit unearned, however. This week, in addition to the googoo eyes she makes at him as soon as he walks in the dojo, we see the would-be couple show off their skills with weapons together, do the whole “avoid the bad guys by holding each other tightly” schtick and a lot of pseudo flirty dialogue. It’s all charming if you don’t pay a lot of attention to it, but it’s wildly inconsistent. Sometimes Danny implies that he is earnestly trying to woo Colleen (his nonsense about intentions) and other times he’s playing the ‘inexperienced nerd’ card. This happens with Ms. Wing too, though Jessica Henwick plays the whole ‘befuddled by attraction” angle better than Finn Jones. Anyway, Danny and Colleen head to the docks to try and get some proof about the drug shipments, which (of course) leads to another fight sequence. This time, Danny takes on a knife-wielding soccer fan in the bed of a cargo truck in what is likely the best fight of the season. Why our hero, a martial arts master of mystical power, should struggle so much with some rando Hand assassin is a little curious, but the choreography is tight even if it ends in a understated, if not overtly exciting manner. If there’s one complaint about the sequence it’s the lighting of the scene, which leaves a lot of the action in the dark. The episode ends with a bit of a “remember who the bad guys are” scene, where Madame Gao murders the assassin that Danny beat up earlier. They even do the dramatic reveal of Gao as if anyone who had been watching the show didn’t know who she was (the scene is also accompanied by the awful line “His hands? Are you sure it wasn’t HIS FIST?!! !”) Still, now that Danny’s got the chemist who makes the Hand’s drugs and the Hand is super pissed – the actual martial arts action of this story should start in earnest. Hopefully.